I got this from one of my beauty boxes from @birchbox . I was pretty excited when I first received it because I like the design. It looks like an art pen, ( cool!) I am always a sucker for packaging. I haven’t use lip liner forever, actually I think I never really use it. Though I was willing to give it a go. I guess since I been ordering these beauty boxes, I been more willing to try “ new” things. haha. When I saw the color, I didn’t really like it, as I normally do not wear dark lipsticks. However, the shade is called “ Nearly Natural” So I thought this may be one of those lipsticks that don’t show a lot of color. WRONG! it is basically exactly the color that it is. Which I don’t really like. So I now regret trying, ‘cause if I didn’t use it, I could have just make it a part of a giveaway! Darn... !! Other then the color, it also has a scent. It reminds me of crayons or something.... Whatever it is, I don’t like it. The lasting power is probably less then 3 hours and it does not moisturize my lips at all. So overall, I do not like this product. Maybe my opinion wouldn’t be so negative if I actually like the color. I don’t understand why this color is “ Nearly Natural”... I mean it’s like a matte dark coral color... if anything is natural, it should show the person’s natural lip color, which obvious varies among people, but just give slight hint of color <--- which was what I was expecting. 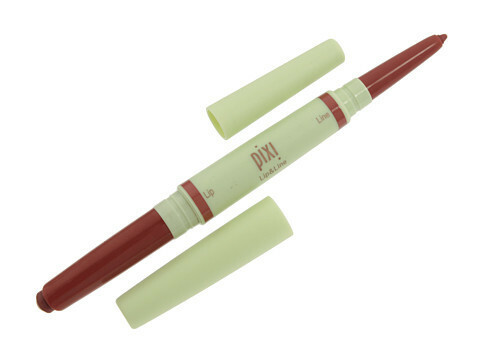 If you are not picky with scents and actually love the color ( or other colors pixi offers) then I would say it’s probably ok to get. Of course, only if you are gaga with lip liners, as I don’t see too much of a use for them especially if last power is really meh... & the full size product is about $18, so it’s not cheap either. PS: I ended up trying out adding lipgloss over the product and I like it better now. Since the gloss would make the color seem a bit lighter. Alright, that’s it for my quick and sincere review! Do you wear lip liners? What do you care the most in a lip beauty product?